Nonsensical in the worst ways with a plodding pace despite its empowering messages. Made for kids only, adults will be bored out of their minds. After the success of Thelma, Ava DuVernay was offered the chance to direct Black Panther. Quoting differences in vision, it’s very clear she was not the right choice. Instead of joining Disney through Marvel Studios, she moved on to adapt Madeleine L’Engle’s novel A Wrinkle in Time instead. You can’t blame her for trying. With an A-list cast and enough money to sink any film into CGI oblivion, DuVernay forgets to inject the film with any adrenaline while Jennifer Lee and Jeff Stockwell’s screenplay meanders its way through wasting a $100 million-plus budget. Meg (Storm Reid) is coping with her father, Mr. Murry (Chris Pine), missing for four years. Mr. Murry was a brilliant scientist who believes he found a way to travel the galaxy using only his mind. Bullied at school by Veronica (Rowan Blanchard), Meg finally defends herself and her younger brother Charles Wallace (Deric McCabe) causing a chance encounter with Calvin (Levi Miller). Soon enough, Mrs. Whatsit (Reese Witherspoon), Mrs. Who (Mindy Kaling), and Mrs. Which (Oprah Winfrey) come calling to inform Meg that her father is trapped on a far away planet by The It (David Oyelowo). Now she must “tesser” via tesseract (a brain frequency) to a far away land along with Calvin and Charles Wallace in order to save her father and bring him home. 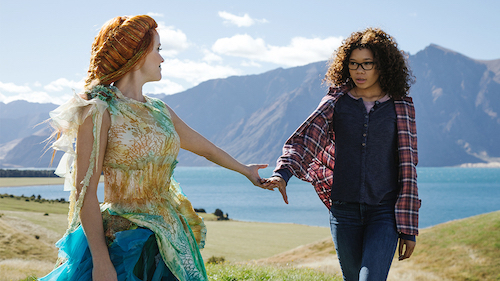 A Wrinkle in Time may only be 109 minutes, but it sure feels like an eternity. Before the film started, I asked a colleague’s wife if she’d ever read the book and she said she tried as a child and again as a teen and was never able to make sense of it. Prepare yourselves adults, you’re about to feel the same way. Nonsensical and boring, there aren’t enough visuals to keep the plodding pace from feeling glacial. The cast never feels inspired — aside from one particularly creepy sequence with Michael Pena — and the visuals aren’t anything special. With L’Engle’s book published in 1962, there are plenty of films since then that were clearly inspired by different aspects. Even Interstellar owes some debt. Apparently it fares well enough with kids at least. Bringing an eight and four-year-old puts it in perspective: adults will hate it, but at least their kids will be entertained. There are family films and then there are children films. A Wrinkle in Time is the latter. If there’s one positive to the film’s release, it’s that at least representation/diversity will win at the box office. It’s just a really funny coincidence that DuVernay is going to lose up against the film she was supposed to direct.